In the event of excessive line pressure, this adjustable valve automatically opens, protecting your pump from damage from excessive pressure. An added feature is the priming valve, which eliminates problems caused by line pressure. Designed to prevent the liquid being pumped from siphoning through the pumphead during both the On and Off cycles, and to keep the liquid in the system from flowing backward through lines and fittings. In-line check valves are installed on the discharge side of the line and prevent the liquid being pumped from flowing backward. Constructed of durable polypropylene, PVC or brass, with FKM O-rings. Verify solution feeding at a glance, no matter how cloudy or discolored the tubing becomes. The rhythmic rising and falling of the float indicates that the positive flow, while the appearance of air bubbles indicates solution may be depleted. 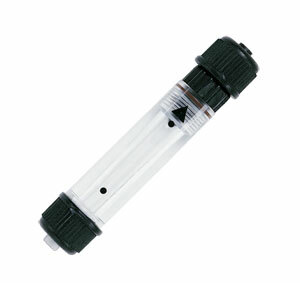 The indicator is an excellent troubleshooting and diagnostic tool. Available individually or in packages of 12. Foot valve strainer bodies are constructed of molded polypropylene with polypropylene screens. The screens act as filters (strainers) to keep particles from entering the suction line and fouling the pumphead. They can be used either as a foot valve or as a bulkhead fitting when equipped with adaptor nut and gasket. Foot Valve Strainer, 1/4" O>D> tube. EP O-Ring. 참고: FPUSV5 fits FPUDT3000 Series pumps.